The Yellow-billed Turaco (Tauraco macrorhynchus) is an African endemic with a large range. It can be found in Angola, Cabinda, Cameroon, Equatorial Guinea, Gabon, Ghana, Equatorial Guinea, Liberia, Ivory Coast, Nigeria, Sierra Leone, South-west Cameroon, South West Congo Republic, Republic of the Congo and the Democratic Republic of the Congo. 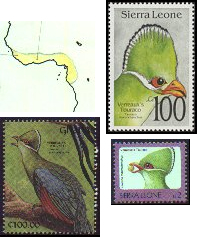 This species' geographical distribution is similar to the Green Turaco, except that the Yellow-billed Turaco prefers primary forests. This turaco prefers forested areas from sea level up to 1600m, with a dense second growth. Even though not globally threatened, the Yellow-bill Turaco's status is monitored due to the threat of continued lowland deforestation in its native habitat. 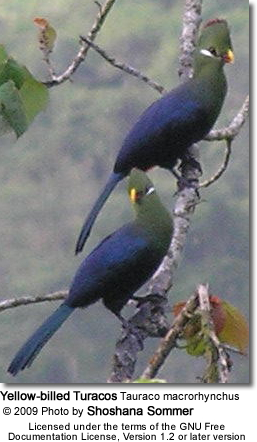 The typical Yellow-billed Turaco measures between 15.7- 17 inches or 40 - 43 cm from beak to tail. The males weigh between 9.2 - 9.6 oz or 261 - 272 g, while the females usually weigh between 7.6 - 8.3 oz or 216 - 234 g.
The Yellow-billed Turaco can easily be identified by its yellow bill and lack of nasal feathering, which gives the impression of a large bill (hence the Latin tag "macro-rhynchus"). This Turaco is a commonly heard in interior forests within their range. They have piercing alarm calls that are described as sounding like those of jungle monkeys. Their main diet consists of fruits, but they will also eat seeds, leaves and arthropods. It will feed on invertebrates flushed out by driver ants.